This duster is seriously so festive and perfect! I loved the vibrant color as soon as I saw it on Instagram! How fun is this sparkly clutch, too! Hope you guys have a wonderful and Merry Christmas! Shimmer Sensational! Ahhh that green is to die for! Such a great shade and just the right amount of pizazz to wow em’! Yes, it does remind me of holly! Soooo cool! You are a babe-a-tolla and I wish you and your family a very Merry Christmas! Holiday Hugs! This duster is EVERYTHING!!! I want to live in it! Stunning! I really need those pants, they are so fabulous! What an amazing duster! 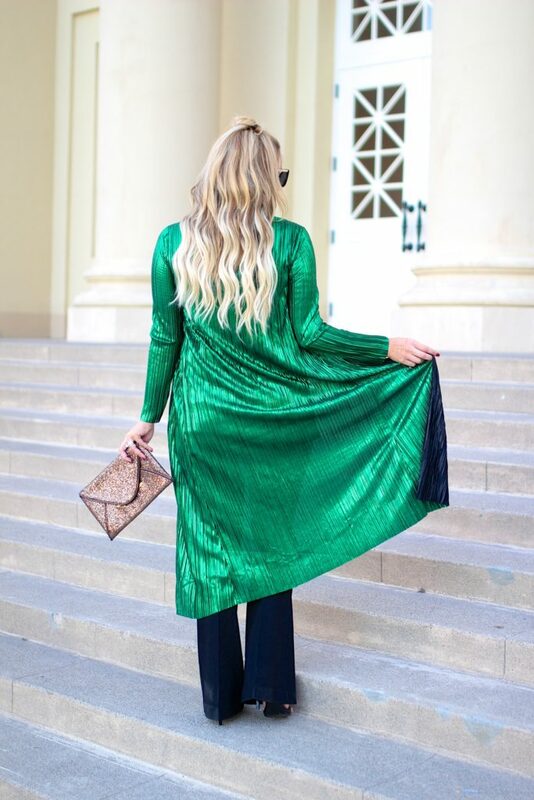 Love how you styled it and it’s perfect for the holidays! Too fierce, mama! Loving that bright + festive green! Merry Merry Christmas! You have been so amazingly festive in your green this year! It always make me feel so spirited for the holidays. Wishing you and your family the best Christmas! What a statement piece. Loveeee the color, gorgeous. What an absolutely stunning shade of green! Love the spectacular shine of this piece, perfectly paired with subtle black tank and pants, beautifully styled! OMG I can´t get enough of this look, super cute!!! That green is so beautiful and considering my love for dusters, this outfit totally works great for me. Such a cute cardigan!! Merry Christmas girl! Beautiful duster and perfect for the holidays! Wishing you a very Merry Christmas too! This duster is stunning, and perfect for the holidays! You look beautiful as always. Wishing you a merry Christmas! That emerald duster is perfect for Christmas! I think next time you should pair it with a red jumper and take the holiday cheer to a whole new level. You look beautiful! That green is gorgeous! I love the shade and the fabric is so pretty! It looks metallic and shimmery! This is such a luxurious and fabulous shade of green, and it’s shinning! Great look dear! This duster is gorgeous! How many ways will you wear it?? I’m sure as many as possible. Love how you styled it with the pants and heels. So pretty! Thank you for sharing with the Thursday Moda.